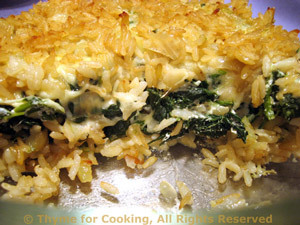 Rice Florentine, with Brown Rice and Spinach, from Thyme for Cooking. Florentine means 'cooked in the manner of Florence'. More simply, it means that there is spinach in the dish. A wonderful way to get this heart and eye healthy vegetable. This looks pretty in a clear glass baking dish if you have one. In small saucepan over medium heat sauté onion in butter for 5 minutes. Add rice and sauté 1 minute. Add stock and cook according to package instructions. Thaw spinach and squeeze out excess moisture. Combine spinach, thyme and yogurt. When rice is cooked spread 1/3rd of the rice in the bottom of the baking dish. Top with half of the spinach, then half of the cheeses. Top with remaining 1/3rd of the rice. Bake, uncovered, at 400F (200C) until cheeses melt and flavors meld or about 15 minutes. Remove and serve directly from baking dish.